The expert reports concluded that the MPD has unconstitutional policies, practices, and customs. And that MPD officers routinely conduct unconstitutional stops and frisks procedures, motivated by race and ethnicity. One report was written by Margo L. Frasier, J.D. Frasier’s employment history includes serving as Sheriff of Travis County, Texas, for over seven years. Frasier acknowledged her bias and declared that she gave deference to the police officers. Deference was not a saving grace. The second report, authored by Dr. David Abrams, revealed that Black and Latino people are more likely than white people to be subject to stops across Milwaukee. The traffic stop rate for Black drivers is more than 500% higher than white drivers. The traffic stop rate is higher for Latino drivers than white drivers by more than 70%. Black drivers are 50% more likely to be searched than whites during a traffic stop. Police are 20% less likely to discover drugs on Black and Latino drivers than on white drivers during traffic stop searches. 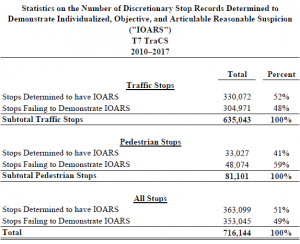 Black people are 500% more likely to be targets of pedestrian stops than white people. The third report, authored by Samuel Walker, Ph.D., reached the same result as the other reports but also found that the FPC was culpable. Walker found that the FPC failed to oversee and supervise operations of the MPD—a statutorily prescribed duty. His determination was supported by the testimony of the leader of the FPC, Executive Director MaryNell Regan. As an Executive Director, Regan was required to review and evaluate all aspects of MPD’s operations, including policies, practices, and patterns. She also was to prescribe, create, and amend policies. However, by her own admissions, Regan failed to fulfill her official duties. Regan confessed that she was not familiar with MPD’s policies, practices, or patterns. She also admitted that she defers operational reviews and evaluations to MPD management. Hence, Regan relinquished her professional responsibilities to others. Coincidentally, Regan submitted her resignation to Mayor Barrett on Sunday, April 22, 2018. The resignation may be an indication that the class-action lawsuit is forging change. But only time will tell. And the same goes for the outcome of the class-action lawsuit.